Perhaps thousands of victims, innocent people extorted, threatened, locked in prison, families destroyed by a Predator who had no problem getting hired and into a position of power. How many hundreds of victims did it take till he was removed. While Harvey Weinstein abused and committed crimes against the rich and famous the real victims can’t afford top lawyers or get the attention famous people get. 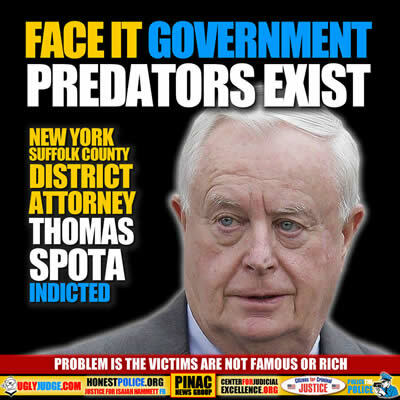 Suffolk County District Attorney Thomas Spota and one of District Attorney Thomas Spota’s top aides have been indicted on charges that they obstructed a federal civil rights investigation into the beating of a handcuffed prisoner by a police chief. District Attorney Thomas Spota has announced his intention to retire after 16 years in office. a day after being charged in an assault cover-up case. District Attorney Thomas Spota, 76, and Christopher McPartland, 51, the head of the district attorney’s political corruption unit, were taken into custody by the FBI on Wednesday.